NagaCorp's planned Naga3 development will add an extra 4,720 hotel rooms across five new towers in what will see Cambodian IR NagaWorld become the "largest riverine integrated resort in the world." 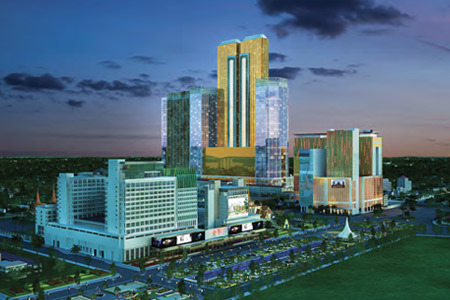 Plans for NagaWorld's planned Phase 3 development were revealed by NagaCorp overnight in a detailed outline of its ongoing expansion. Notably, NagaCorp expects to fulfil around 4.7% of the Cambodia government's ambition to add 100,000 new hotel rooms in Phnom Penh by 2028. The project is again being designed by Steelman Partners, while the hotels are set to be managed by one or more well-known international hotel brands. Steelman Partners is consistently ranked as one of the top 300 largest architectural firms by Architectural Record Magazine and is on Engineering News-Record's Top 500 Design Firm list.